Ice streams and outlet glaciers are relatively fast-flowing regions of ice that are adjacent to nearly stagnant ice or mountains. These ice streams are visible as the streaks of purple through the yellow background in figure 1 (Mouginot et al., 2017) showing the surface velocity of the Antarctic Ice Sheet. 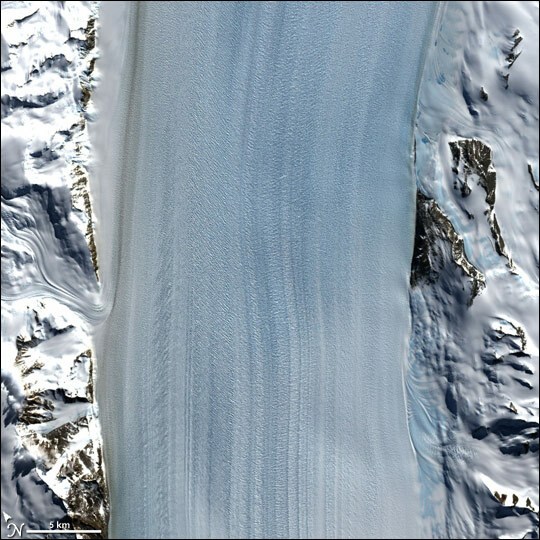 Although these fast-flowing ice streams represent a relatively small fraction of the surface area of Antarctica, they drain more than 90% of the interior of the ice sheet. In this way, these ice streams carry the snow that is accumulated and compacted within the continent into the ocean. As a result, understanding how the Antarctic Ice Sheet responds to climate change and contributes to sea level rise requires an understanding of the dynamics of the fast-flowing glaciers and ice streams. Ice streams are lubricated by water at the base and likely arise due to a thermoviscous instability within the ice (Hindmarsh, 2004; Schoof and Hewitt, 2013): fast flow is accompanied by high rates of shear, which heats the ice, lowering the viscosity, allowing for more shear and a positive feedback loop that generates narrow, warm shear margins. In many ice streams, the shear heating within the margin likely becomes significant enough to form temperate ice, a porous ice zone that is at the melting temperature (Schoof and Hewitt, 2016). The temperature of glacier ice controls the rate at which it flows by modulating the ice viscosity. From the typical surface temperatures in Antarctica to the melting temperature, the ice viscosity softens by an order of magnitude (Cuffey and Paterson, 2010). In Meyer and Minchew (2018), we derive a one-dimensional thermomechanical model to infer which Antarctic Ice Sheet shear margins may contain temperate ice. As the name suggests, this model couples the mechanical ice deformation to the ice temperature. The transition from fast to slow flow in the shear margins dissipates energy by friction, which increases the ice temperature. With this model, we focus on the basic physical processes at work; we distill the problem to the essential mechanisms and derive expressions for the critical shear strain rate at which a zone of temperate ice initiates and the thickness of the temperate zone. We show that the critical strain rate and temperate zone thickness only depend on two nondimensional parameters — the Brinkman and Péclet numbers — which are functions of observable parameters such as shear strain rate, surface temperature, surface accumulation rate, and ice thickness. The development of temperate zones is incited by shear strain rates (Brinkman number) and suppressed by the advection of cold ice from the surface (P ́eclet number), which is proportional to the surface accumulation rate. Applying recent observations and outputs from a regional climate model, we have shown that many active glacier shear margins could contain temperate ice, as shown in figure 2. The spatial distribution and thickness of temperate zones are mainly controlled by shear strain rates and surface accumulation rates. Shear margins of fast-flowing glaciers and ice streams are a primary source of resistance to ice flow. Shear stress in the margins is a function of the rheology of ice, which depends on the ice temperature. In glaciers where our model predicts thick temperate zones immediately upstream of the grounding line, shear margins extend to great distances (>100 km) onto the floating ice shelf. We hypothesize that this is due to the downstream advection of warm, soft ice onto the ice shelf. As a result, the development of temperate ice upstream of the grounding line might help determine the structural integrity of the ice shelf and to modulate the ability of the ice shelf to buttress the glacier, thereby generating the potential for ice-sheet retreat due to thermoviscous feedbacks. 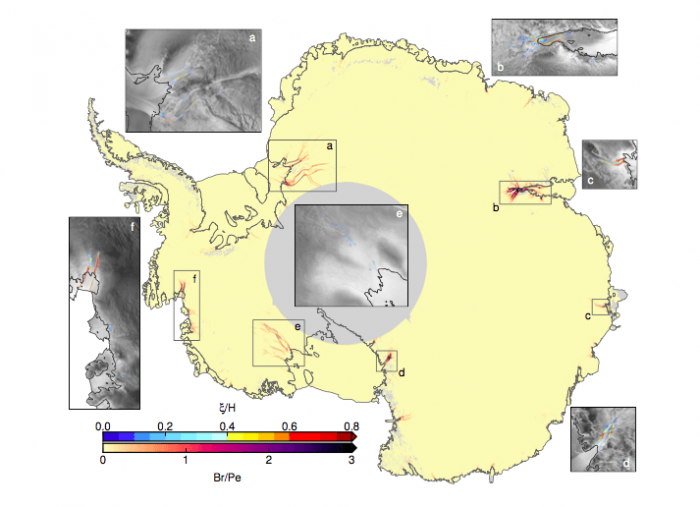 These findings are described in the article entitled Temperate ice in the shear margins of the Antarctic Ice Sheet: Controlling processes and preliminary locations, recently published in the journal Earth and Planetary Science Letters. This work was conducted by Colin R. Meyer from the University of Oregon and Brent M. Minchew from the Massachusetts Institute of Technology. K. M. Cuffey and W. S. B. Paterson. The Physics of Glaciers (Fourth Edition). ISBN 9780123694614. Elsevier, 2010. R. C. A. Hindmarsh. Thermoviscous stability of ice-sheet flows. J. Fluid Mech., 502:17–40, 2004. doi: 10.1017/S0022112003007390. C. R. Meyer and B. M. Minchew. Temperate ice in the shear margins of the antarctic ice sheet: Controlling processes and preliminary locations. Earth Planet. Sci. Lett., 498:17 – 26, 2018. ISSN 0012-821X. doi: 10.1016/j.epsl.2018.06.028. C. R. Meyer, A. Yehya, B. Minchew, and J. R. Rice. A model for the downstream evolution of temperate ice and subglacial hydrology along ice stream shear margins. J. Geophys. Res., 123(8):1682–1698, 2018. doi: 10.1029/2018JF004669. J. Mouginot, E. Rignot, B. Scheuchl, and R. Millan. Comprehensive annual ice sheet velocity mapping using Landsat-8, Sentinel-1, and RADARSAT-2 data. Remote Sensing, 9(4):364, 2017. doi: 10.3390/rs9040364. C. Schoof and I. Hewitt. Ice-sheet dynamics. Ann. Rev. Fluid Mech., 45:217–239, 2013. doi: 10.1146/ annurev-fluid-011212-140632. C. Schoof and I. J. Hewitt. A model for polythermal ice incorporating gravity-driven moisture transport. J. Fluid Mech., 797:504–535, Jun 2016. doi: 10.1017/jfm.2016.251. 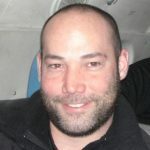 Colin R. Meyer is a Postdoctoral Scholar in the Department of Earth Sciences at University of Oregon. Brent Minchew is an Assistant Professor of Geophysics at MIT.